Pouring the traced soap recipe into silicone loaf molds, then smoothing down to make sure there are no air bubbles. Have you ever wanted to learn how to make cold processed soap? Cold processed soap is simply the blending of oils (and essential oils) with a water/lye solution. The blending of these two types of liquid begins a process of turning the oils to a solid that will lather, and offer cleaning qualities. We are so pleased to announce that a two week long class will be offered at Art House, located in the Brooklyn Center neighborhood of the west side of Cleveland. Cost: $50.oo – the student will make a 1 pound loaf of soap, and several jars of salt scrub. All supplies will be included, and the student will go home with their own 1 pound mold for future use, along with several recipes. 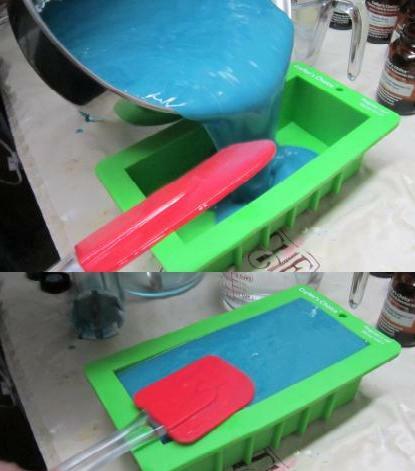 1 pound mold will yield 4-5 bars of soap. Please note – because this is a chemical process you should use caution when working with the liquid blending, and the soap itself requires a 4 week cure time before use. Using the soap before this might mean that the soap pH level is not totally neutralized by the curing process. How to sign up: Online. Click the link below (the art house logo) to sign up. I have always wanted to make cold pressed soap in order to use my bees’ beeswax in it. I’ve never found a recipe. I wish I could attend your close. I have always wanted to make cold pressed soap in order to use my bees’ beeswax in it. I’ve never found a recipe which incorporates beeswax. I wish I could attend your class and pick your brain. Bees Wax works wonderfully with some of our softer formulas… such as the olive oil only (castele soap) to help harden the soap a bit. We noticed the bees wax adds a nice light scent to the formula too… and it is just wonderful on the skin. Where do you live?